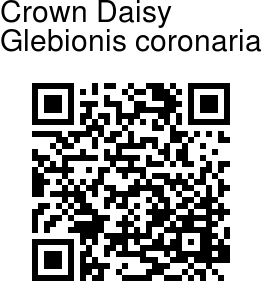 Crown Daisy is a leafy herb, being one of the few annual plants in its genus. It has yellow ray florets grouped in small flower heads and aromatic, bipinnately lobed leaves. Leaf blades oblong to obovate, mostly 30-55 x 15-30 mm, mostly 2-3-pinnately lobed, ultimate margins toothed. Ray flowers are pale yellow, sometimes white-tipped, blade oblong to linear, 1.5-2.5 cm. Ray cypselae triquetrous, 2.5-3 mm, angles winged, faces obscurely nerved or ribbed. Disc florets are 2.5-3 mm, obscurely ribbed, sometimes with upper (rarely the lower) rib winged. 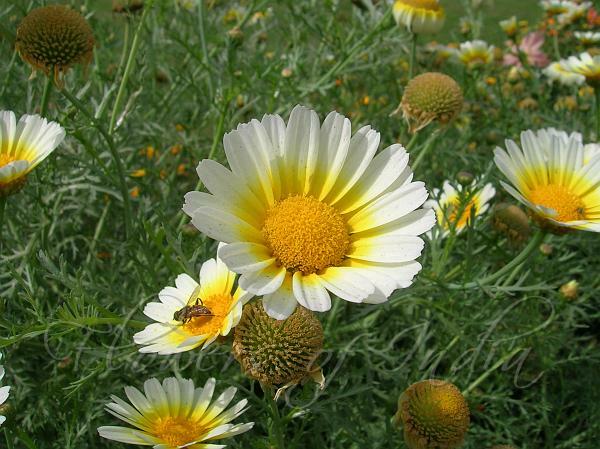 Crown Daisy is cultivated in north India in winters and spring. It is native to the Mediterranean region.